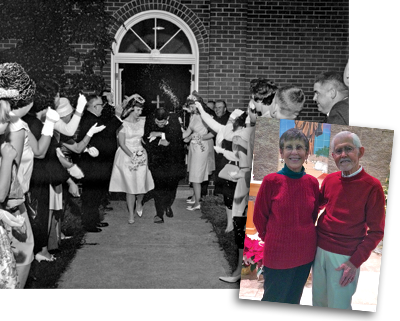 For decades, Hawkeye couples have exchanged vows at Danforth Chapel. 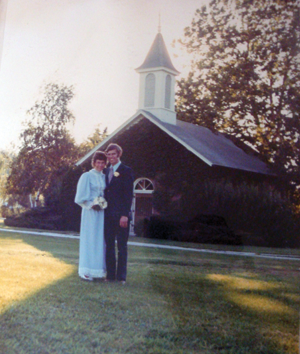 Readers share photos and memories of their wedding day at this campus landmark. 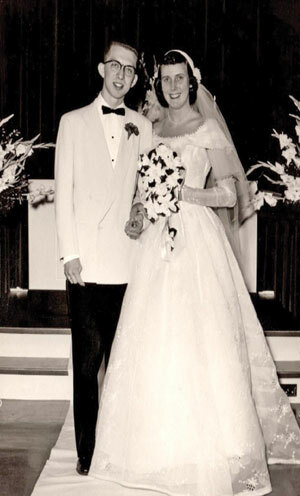 George Tracy, 54BA, 56BSPh, 60MS, and Holly Mundt Tracy, 53BSPE, on June 14, 1953. Inside the little red-brick chapel, nestled in the heart of campus at Hubbard Park, lives come together year after year. Couples walk down the aisle and into their futures, amid smiles and bubbles and grains of rice. On the east bank of the Iowa River, just south of the IMU, sits Danforth Chapel–home to weddings, private worship, small group meetings, and student meditation since its formal dedication on Jan. 11, 1953. During the 1950s and '60s, St. Louis businessman and founder of Ralston-Purina William H. Danforth established a foundation that funded the construction of 24 Danforth chapels on college campuses nationwide, including the University of Iowa. Danforth offered the UI two gifts of $5,000 each to build a non-denominational chapel to represent people of all beliefs. In a university video about the chapel's history, UI archivist David McCartney explains: "It was the wish of William Danforth that it be a building that welcomes everyone." "I remembered Danforth Chapel as I often passed it on campus. When I envisioned it lit up with candles for an evening service, I knew we had to have our ceremony there." Bill Walker, 90BBA, and Amy Pavlacic Walker, 90BA, on Nov. 3, 2001. Danforth Chapel's design came from St. John's Methodist Episcopal Church of Graham Township, an 1870s pioneer church in northern Johnson County. Also known as "Old Zimmerman Church," it later fell into disrepair–but not before it came to the attention of R.H. Fitzgerald, director of the IMU and School of Fine Arts in the early 1930s. It was Fitzgerald who first raised the idea of reproducing the structure on campus with university planners. Interestingly, Regional artist Grant Wood also made a note of the church's simple, yet charming frame and his pictures and drawings were used to prepare building plans. Twenty years later, the dream came to reality with the chapel's dedication. The building was formally dedicated that January day with William Danforth presenting the church to the State University of Iowa. Also on hand were UI President Virgil Hancher, 18BA, 24JD, 64LLD, offering remarks, and other faculty and student representatives. More than 50 years since it opened to the community, Danforth Chapel remains a central part of the University of Iowa's historic landscape. The modest white pews, the simple altar, the arching windows–such an intimate, charming atmosphere has served as the setting for many beautiful moments. We'd like to share some of those here. Jeremy Lewis, 95BBA, and Erin Thomas-Lewis on Oct. 18, 2009. "After a whirlwind courtship–11 months from meeting to walking down the aisle–Danforth Chapel was a wonderful setting for our wedding. I had only lived in Iowa for six months when the flood damaged the chapel. I'm so glad it was restored in time for our wedding." Justin Ahlf and Alysha Gilpin Ahlf, 04BA, on May 29, 2010. "I graduated with an English degree and have worked at the UI as a merit employee since 2003. During my undergraduate years, I noticed the cute little chapel by the IMU as I walked to the English-Philosophy Building for classes. When Justin and I were looking for Iowa City wedding venues in 2009, it popped into my mind. We wanted a non-denominational venue where we could have our own officiant, and Danforth fit the bill. The newly refurbished chapel had just reopened after the 2008 flood when we had our wedding. We knew we wanted my uncle Patrick Gilpin to be our officiant; it turns out that Patrick and his wife, Sandy, were also married at Danforth in 1980. I will always remember waiting for the ceremony at the Iowa House Hotel in the IMU, and seeing my soon-to-be husband waiting for me at the front of the chapel as I walked down the aisle with both of my parents." Dennis, 79BS, and Lori Welp Kruse, 78BA, on Aug. 30, 1980. 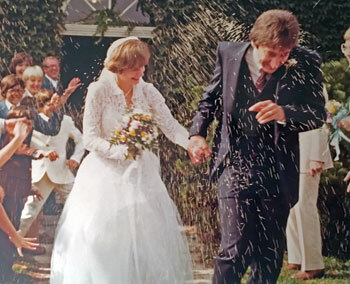 "We have just celebrated our 35th wedding anniversary. We met through the Mortar Board society our junior year on campus. Lori was president and I was secretary (those roles have not changed much during our marriage). 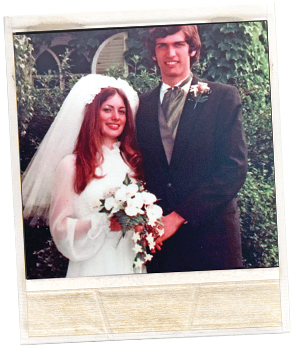 We both were honored in 1978 as recipients of the Hancher-Finkbine medallion and profiled in Spectator magazine, so it seemed appropriate to be married on campus. In addition, Danforth was a philanthropist from the Ralston-Purina fortunes, and my parents, with their agricultural backgrounds, were quite knowledgeable about his legacy. Our reception was at the Iowa River Power Restaurant in Coralville, and our cake was made by First on Fifth, a Coralville catering business that I had worked for part-time while attending school. Both Lori and I worked as ushers at Hancher. Needless to say, we were quite saddened when we saw the big flood cause damage to the chapel, restaurant, and Hancher–all significant landmarks for us. But we are happy to see that two of the three are now repaired and back in use, and Hancher will be soon." 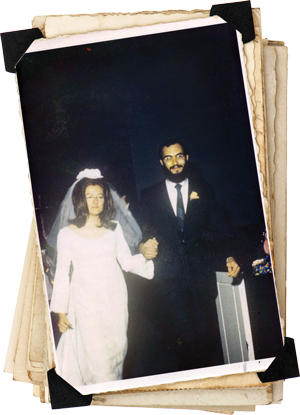 Steve Saur, 71BA and Pam Nash Saur, 70BA, 72MA, 82PhD, on Nov. 1, 1969. In the spring of 1968, Iowa sophomores Pam Nash and Steve Saur met in the lobby of Currier Hall. They were on their way to Omaha to campaign for anti-Vietnam War presidential candidate Eugene McCarthy. A romance developed and the couple soon married. Their senior year, and first year of marriage, was one of Iowa City's most tumultuous, marked by constant demonstrations, vigils, building occupations, anti-war speakers, arrests, conflicts, busloads of National Guard troops, and a partial university shutdown. Nevertheless, Pam completed her B.A. in German and European Literature and Thought, having to cross picket lines to take her finals. Steve earned his degree in social work in 1971 and became a halfway house director and child protective services worker. Richard Rozek, 74MA, 76PhD, and Roxana Johnson Rozek, 75BA, on Aug. 7, 1976. "We initially made eye contact in Phillips Hall during early March 1976. However, it was not until March 24, 1976, that we were formally introduced by a mutual friend at Joe's Place. Our relationship developed quickly and we were engaged on May 11, 1976. We will celebrate our 40th wedding anniversary this year." Jeff Kueter, 93BA, and Tracy Roztocil Kueter on May 23, 1998. 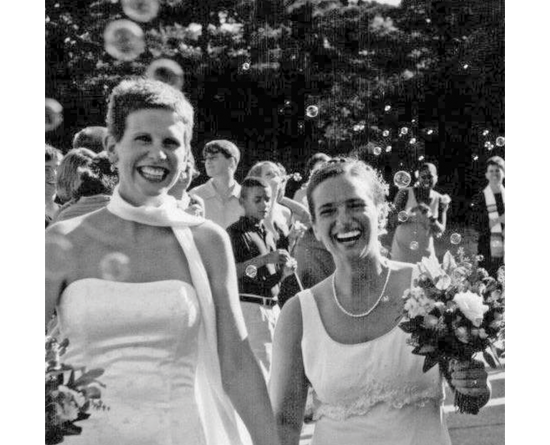 "We were high school sweethearts who both attended Iowa and then moved to Washington, DC. After several years there, we finally decided to get married. Neither of us were members of an Iowa church at that time and so we looked for a unique place for our event. Having become enthusiastic volunteers for Iowa in the DC area, a UI venue was an attractive option and Danforth Chapel ranked high on our list. 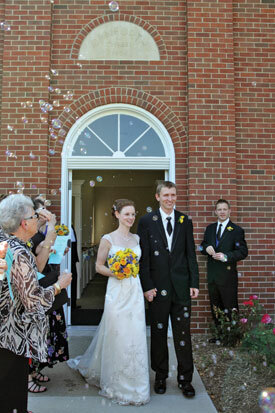 The idyllic views of the Iowa River offered a perfect background with the chapel's simple beauty." Ronald Rogers, 61BSPE, and Virginia Jenkins Rogers, 62BSN, on June 1, 1962. 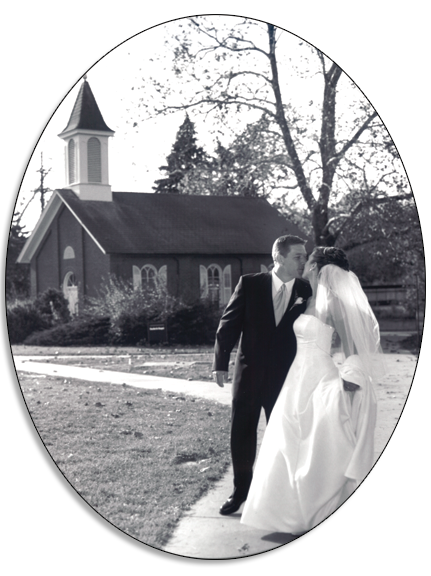 "We were scheduled to be married at First English Lutheran Church on the corner of Dubuque and Market (now Gloria Dei). However, on April 1, 1962, an arsonist started a fire in the church and it was destroyed. We then decided that Danforth Chapel would be where we would marry. It must've been a good start as it has been 53 years since." Rick Sumner, 75BA, and Judy Weik, 75BFA, 75SE, 76MAT, on Aug. 14, 1976. "After a small reception at the Ironman Inn, we left Iowa City for the Amanas and spent the night at a bed and breakfast in Homestead. We were on the road with all our worldly possessions in our '65 Mustang for the next three days, traveling to Tucson, where, two days after our arrival, Rick started graduate school at the University of Arizona. We now live in Oak Park, Illinois, and have two adult children and one grandchild. 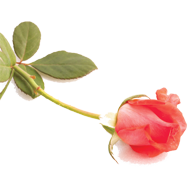 We celebrated our 39th wedding anniversary last August." Joseph Judge, 01BA, 04MA, 09MA, and Betsy Brice Judge on June 14, 2015. 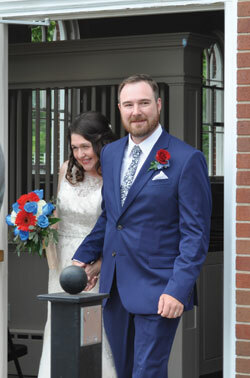 Joe, a three-time graduate, and Betsy, a longtime employee of the UIHC ER department, were married on Flag Day. 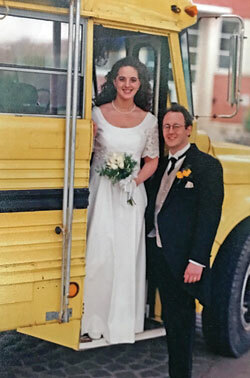 Since Joe is a high school social studies teacher, the two often joked they would get married on that occasion–and they did. One of Joe's friends from his Hawkeye Marching Band days put together a brass quintet and the Danforth acoustics created a booming, breathtaking moment when the bride entered. Of course, the couple exited to "On Iowa." Being just down the hill from the Old Capitol gave the couple the opportunity to take pictures on the spiral staircase while their guests made their way to the reception at the IMU. "Danforth holds about 90 people and we had invited some to the ceremony and a whole lot more to the big party afterward. Some folks found out where the wedding was and showed up anyway." Jodi Lundquist Linley, 98BA, 02MA, and Brenda Bruce Linley, 93BA, 99MA. "Jodi and I knew each other peripherally through mutual friends, but had our 'meet cute' at the graduate student prom in the IMU ballroom. I was taking off my coat as Jodi walked in, and she says time stood still when I swished my hair around. We are both big Hawkeye fans and alumni and wanted to have the University of Iowa as part of our wedding. Since Danforth Chapel sits outside the IMU, the place that sparked our romance, it made sense to have it there. We had a couple of wedding crashers. Danforth holds about 90 people and we had invited some to the ceremony and a whole lot more to the big party afterward. Some folks found out where the wedding was and showed up anyway." Herbert Jordan and Linda Smith Jordan, 62BA, 64MA, 72PhD, in June 1965. 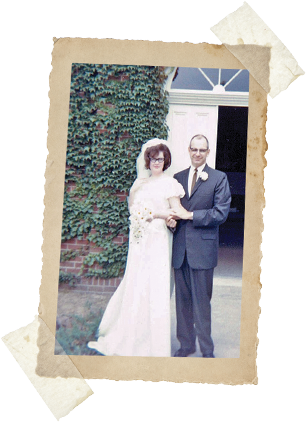 "We met at a Christmas party in 1964 and were married six months later. Linda was a doctoral candidate in the Department of Speech Pathology and Audiology, and I was the new chief of audiology-speech pathology service at the VA hospital. We continued to live and raise our family in Iowa City and remain Hawkeyes–Linda a native Hawkeye with all three degrees from the UI and I an adopted one." Daryl Krantz and Anita Oestreich Krantz, 62BSN, on July 22, 1972. "It was 95 degrees, but a beautiful day. We've been married 43 years and have two children and two grandchildren. Although we live in Massachusetts now, we are all Hawkeyes." Jon Hart, 71BS, 74DDS, and Mary Easton Hart, 72BSN, 72RN, on May 27, 1972. "We were married on a very warm spring morning, the first of five weddings that day. Mary had graduated from the College of Nursing the day before our wedding. Many of our family members were in the wedding party to allow for more guests in the limited seating. The wedding was at 9 a.m. with a reception following in the Old Gold Room of the Iowa Memorial Union. We were off on our short honeymoon by 11 a.m.!" For more Danforth stories and photos, click here. Dallas-Fort Worth IOWA Club members tour the plant where UI footballs are made. Find out what your former classmates are doing now. Iowa City couple Arthur and Miriam Canter share the secret to a long-lasting marriage. Two memorable trips provide business magnate and World War II veteran Henry Tippie occasion to reflect on a remarkable life.